My ears were still ringing. The tears were still fresh. The day itself was ok, but at 3:04, I got a phone call that I try to forget. I can’t tell you any more than it was horrible. The worst accusations. No inquiries to what happened. Pure, unadulterated hate. It was the single worst day of my teaching career. So, when I went home, I had an episode of Every Classroom Matters to record with my friend Alicia Roberts from Arizona. We were supposed to talk technology. I say supposed because the moment I got her and my senior producer Jeannette on the line, I burst into tears. It was too much. I trust these two women deeply, and all the pain came out through the phone line. I sobbed. So, we sat there wondering what to do with me. We decided that the calamitous school year Alicia had and my devastating day could not be wasted. We decided to speak to all you who struggle. We could always leave the result on the cutting room floor. Or it might help someone one day when enough time had passed to let the show air. So, if you are falsely accused, yelled at, hurt, or misunderstood — dear friends, this show is for you. I can’t fix these problems, but my friend Alicia and I can share how we dealt with them, each in our way. No tear is wasted when you use the heartache to serve and encourage others. Here’s to you, teachers. Few people understand the hurt and betrayal teachers feel when these things happen. I know the pain. Alicia does too. You are not alone. You are noble. You matter. Betrayal happens to us all. What to do when you have difficult conversations. How a polar bear led to Alicia deciding to move to another school. Sometimes you go, sometimes you stay. It depends on your situation. We all need people who love us and encourage us when we’re down. Alicia encourages me and it is overwhelming. We all need people who love us and encourage us when we’re down. I hope that all of you listening out there will appreciate and understand that it takes courage to share this show. I also think that administrators should listen to know how it feels when teachers are in this situation. Will you go encourage someone who is having a hard time today? Please? 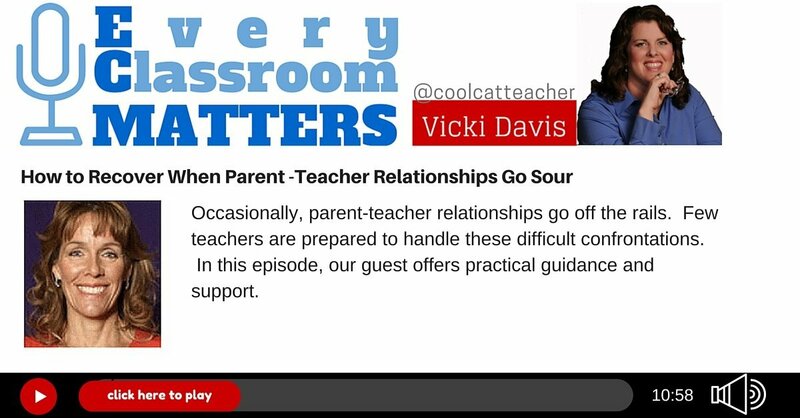 The post What I Learned from The Worst Day of my Teaching Career appeared first on Cool Cat Teacher Blog by Vicki Davis @coolcatteacher helping educators be excellent every day. Meow!